We’re in a series considering how the Bible evaluates leadership through the lens of a shepherd (See: What’s in a Name?). But I’m convinced that our use of the word “pastor” or “shepherd” has become unhinged from its biblical roots. We just don’t know what the word means anymore. And it’s not just in the church’s use of the term. The term “pastoral” has been applied to literature and art set in an idealized rural context in order to present a quieter, simpler tone for an urban audience. In that case, “pastoral” conjures up images of serenity and calm. The word, pastoral, in church circles is often similarly equated with gentleness and compassion. If you describe someone as being “very pastoral,” it implies a warm tenderness towards people. And these are qualities that are certainly a part of the shepherd image, but they’re not at the forefront. In fact, if a shepherd spends all his time nuzzling with the cute, little lambs, or binding up the sick ones, the flock will scatter, starve and die. 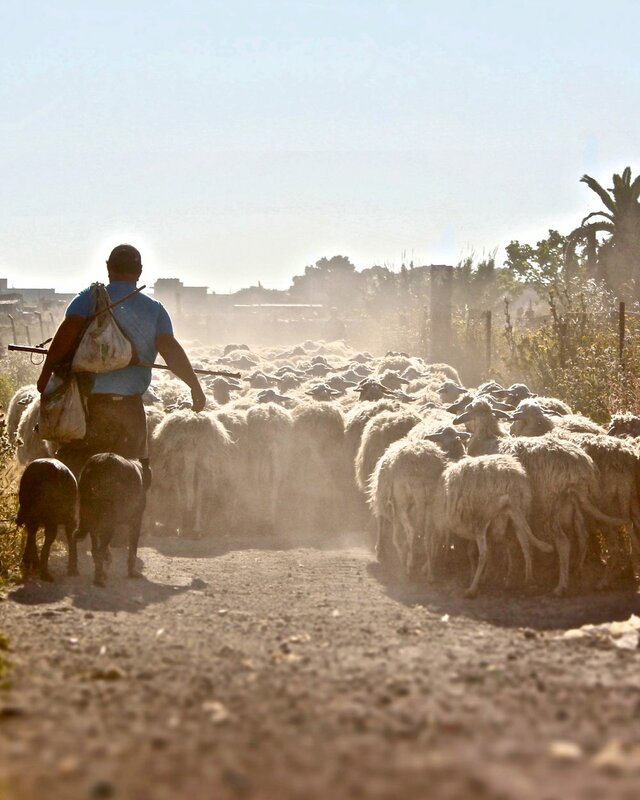 A shepherd is pre-eminently called to lead. A good shepherd needs to have a plan. Sheep need a variety of vegetation to thrive (See: Productivity and Provision). And as we’ve seen in previous posts, without adequate water, they will be soon become dehydrated (See: Thirsty Eyes). Because of this, shepherds need to constantly be thinking about the next pasture where they will lead the flock and chart the course there in a way that ensures consistent access to water. Sheep are followers, so if the shepherd doesn’t lead, the sheep will go looking for pasture and water, themselves, and the flock will soon scatter, to their own peril. In this sense, our use of the word “pastoral” is all wrong. Nobody uses the word to speak of a leader’s planning and guidance. Where our usage is correct is in describing how a good shepherd should lead. When the people sang a song to God in gratefulness for their deliverance from Egypt, they rejoiced that He had led them in “steadfast love” (Exodus 15:13). That is, there was a compassion and faithfulness in the way that He guided them. In Psalm 23, David famously said, “He leads me beside still waters.” There, the point is that God is careful to remember David’s thirst as he leads him to the next destination. Because flocks are regularly on the move, knowing how fast to drive the flock and when to slow down for the weak was a critical skill. When Isaiah speaks of God leading the exiles back to the land he says, “He will tend his flock like a shepherd; he will gather the lambs in his arms; he will carry them in his bosom, and gently lead those that are with young” (Isaiah 40:11). Again, the shepherd leads, but he does so compassionately. Shepherds are leaders. A shepherd without a plan may be nice but they’re not “pastoral” in the biblical sense of the word. Whether you are an executive, manager, church leader, or parent, God has called you to lead and He wants you to have a plan to guide those He’s entrusted to you. But shepherd leaders guide people uniquely. They steer people, but they also care. And that call to compassion makes them sensitive to avoid moving too quickly. Shepherd leaders also lead people faithfully. They speak truth. They guide with integrity. They earn the right to be followed. Our world has lots of leaders, but it needs a lot more shepherds! For more information, check out Timothy Laniak’s book, Shepherds After My Own Heart, which has been my guide in understanding the role of a shepherd in this series.